Need this recipe to be vegan? Use vegan margarine to keep it vegan. Many people actually prefer the taste of margarine in recipes such as this one, where you'll actually taste it a bit, and aren't just using it to soak up bread as in French toast, for example, so don't be afraid to use margarine instead of butter. This healthy grilled apples in foil recipe is vegetarian and all of the ingredients are gluten-free too. While the barbecue is warming up, carefully remove the core from the apples, leaving the bottom intact. Spoon a full tablespoon of the cinnamon and sugar mixture into each apple, and top each with 1/2 teaspoon of vegan margarine or butter. Carefully wrap each apple in aluminum foil and place on the grill. Cook for about 20 minutes, turning a couple times to ensure even cooking. Depending on how hot your grill is, your apples may need as little as 15 and as much as 30 minutes to cook, so pierce with a fork a couple times to see how soft they are. Always be careful when opening foil packets from the grill as the steam will be hotter than you think, even if you've let the packet cool for several minutes. 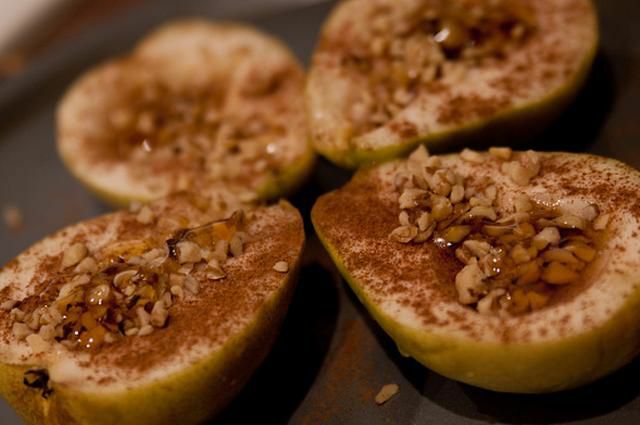 Sprinkle with some chopped nuts if you'd like, and enjoy your vegan grill-baked apples. For a smaller serving size for kids, you can also slice the apples in half as pictured then spoon out the core, sprinkle them with the cinnamon sugar mixture and dot with vegan margarine before wrapping up in a foil packet. A touch of nutmeg or pumpkin pie spice would be nice along with the cinnamon and sugar. Other suggestions for making grill-baked apples in foil? Try adding in raisins, use brown sugar instead of regular white sugar, or add in some dried coconut flakes. Make it a full dessert by serving with a scoop of vanilla ice cream or, if you're not eating vegan, some fresh whipped cream (or a dollop of mascarpone cheese and a drizzle of fruit brandy or a balsamic reduction, depending on your tastes.